Check out my Journey to Japan! 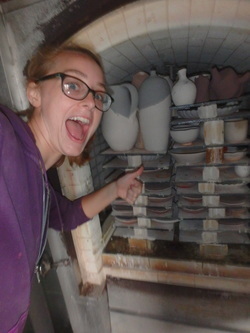 After gra​duating with her Masters of Fine Arts from Bradley University in Peoria, Illinois, Kari studied abroad in Seto, Japan under Ceramic Sensei, Hirosige Kato. Upon returning to Illinois she started her own business called Kari’s Clay Creations. Starting out of her garage, selling art at fairs and festivals, Kari has recently moved to North Carolina and teaches at Fayetteville Technical Community College, continuing her exploration of sculptural tableware. With a sense of love and community, Kari’s pottery serves and connects family and friends, lovers in intimate settings, and spans the globe connecting strangers.